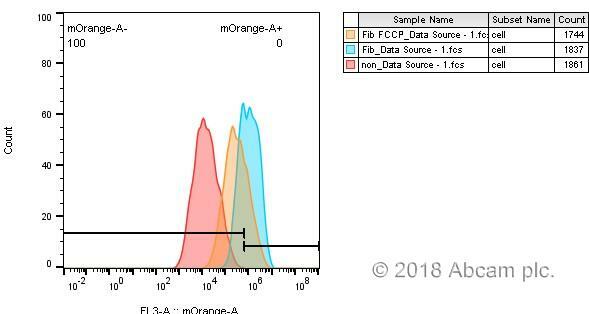 TMRE-Mitochondrial Membrane Potential Assay Kit ab113852 is used for quantifying changes in mitochondrial membrane potential in live cells by flow cytometry, microplate spectrophotometry and fluorescent microscopy. ab113852 uses TMRE (tetramethylrhodamine, ethyl ester) to label active mitochondria. TMRE is a cell permeant, positively-charged, red-orange dye that readily accumulates in active mitochondria due to their relative negative charge. Depolarized or inactive mitochondria have decreased membrane potential and fail to sequester TMRE. The TMRE protocol also uses FCCP (carbonyl cyanide 4-(trifluoromethoxy) phenylhydrazone), which is a ionophore uncoupler of oxidative phosphorylation. Treating cells with FCCP eliminates mitochondrial membrane potential and TMRE staining. TMRE is suitable for the labeling of mitochondria in live cells and is not compatible with fixation. - analyze with micro-plate reader at Ex/Em 549/575 nm, flow cytometer using 488nm laser for excitation and at emission 575 nm, or fluorescent microscope. TMRE is only suitable for use with live (not fixed) cells. Mitochondrial Membrane Potential is an important parameter of mitochondrial function used as an indicator of cell death. The collapse of the mitochondrial Membrane potential coincides with the opening of the mitochondrial permeability transition pores, leading to the release of cytochrome c into the cytosol, which in turn triggers other downstream events in the apoptotic cascade. 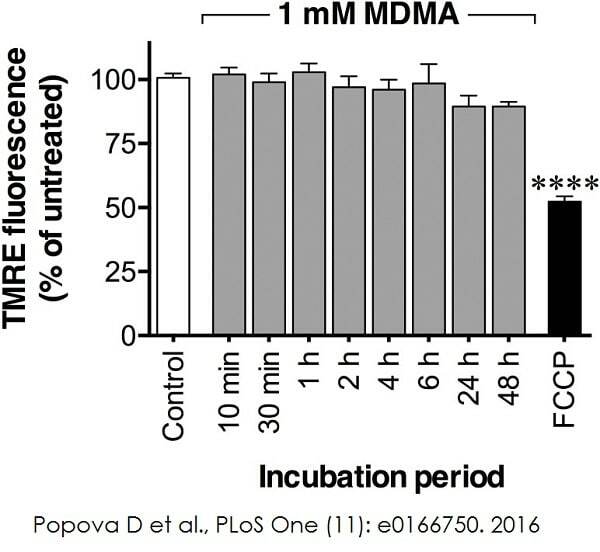 P19 neurons (750 cells/mm2) were exposed to MDMA on days 7–9 in serum-free medium for 10 min up to 48 hours. The positive control FCCP (carbonyl cyanide-p-trifluoromethoxyphenylhydrazone), an uncoupler of mitochondrial oxidative phosphorylation, was applied at the concentration of 5 μM for 10 min. The cells were incubated with 500 μM TMRE for 30–45 min at 37°C, 5% CO2, followed by washing once with 100 μl of HBSS containing 0.2% bovine serum albumin. A volume of 200 μL of HBSS containing 0.2% bovine serum albumin was added to each well, and the fluorescence was measured with excitation/emission: 544/590 nm. A: HeLa cells (adherent) were cultured on coverslips and stained with ab113852 (200nM TMRE) for 20 minutes in media, washed briefly with PBS and immediately imaged. B: Jurkat cells (suspension) were stained and washed as above and then transferred to a slide and immobilized under a coverslip for imaging. Analysis of TMRE staining using a fluorescent plate reader and a microplate. Chart showing mean fluorescent intensity +/- standard deviation from quadruplicate measurements of 400 nM TMRE stained Jurkat cells in a 96-well microplate +/- treatment with FCCP. Flow cytometry histogram of Jurkat cells stained with ab113852 (100nM TMRE) with (blue) or without (red) treatment with 100µM FCCP. What is your recommendation for plates to use with this assay? The recommendation is for clear bottom, black wall microplate that (a) cells will grow on and (b) is compatible with plate reader. What are the differences between ab113852 TMRE—Mitochondrial Membrane Potential Assay Kit and ab113850? Which one is more sensitive or more suitable for stem cells? Thank you for your inquiry. I heard back from the lab regardingthese two distinct dyes that both measure mitochondrial membrane potential. TMRE stains mitochondria only when there is a membrane potential. JC-1 is slightly different in that it has distinct emission spectra depending on whether mitochondria have high or low potential. TMRE can be measured in a spectophotometer, fluorescent microscope or flow cytometry. JC-1 can be measured in a spectrophotometer. Details are in the respective protocol booklets. https://www.abcam.com/ps/products/113/ab113850/documents/ab113850%20Protocol%20(Website)%20v2.pdf https://www.abcam.com/ps/products/113/ab113852/documents/ab113852%20protocol%20final%20v2%20(website(.pdf For you, wewould recommend TMRE with analysis on a flow cytometer. Flow cytometry is both sensitive and amenable to very few cells. I hope this information helps. Please contact us with any other questions. To measure mitochondrial activity in human fibroblast cells, we applied TMRE mitochondrial membrane potential assay kit. It showed great correlation with Seahorse analysis which measured OCR (oxygen consumption rate). after the TMRE incubation, how long does the user to have to read the samples? Is it immediate, or is there a window after the incubation? The samples should be read immediately after the 15-30 minute incubation with TMRE. Since the cells are live, as the health of the cell declined the signal from the dye would also diminish. Inquiry: Is there any alternative for a positive control besides FCCP for this assay? Culture condition? For another positive control, CCCP is suitable (5-50 μM CCCP for 30 to 60 minutes at 37ºC). Can we use this kit to measure mitochondrial membrane potential of yeast (S. cerevisiae or S. pombe)? It all depends on the sample (embryos vs. explant vs. whole work). We have only worked with this dye using tissue culture cells (monolayer or suspension). If the samples are dissociated cells then TMRE labeling should work. Otherwise, we don’t know how well or deeply the dye can penetrate across cell layers (e.g. into tissues or embryos). The dye for measuring the potential in the kit is species independent, so it is more a matter of the sample type. We have no experience in using TMRE to stain isolated mitochondria from any source – it is a tricky proposition as you would need intact/non-damaged mitochondria which retain membrane potential therefore we wouldn't recommend this. However, I would like to stress that this kit is only really for mitochondria labelling in intact cultured cells. I am getting RFU ˜ 10^2 with and without the FCCP. Do you have any suggestions for how to improve my results? Thank you for contacting us. My colleague from our MitoSciences lab has provided the following recommendations. The lack of signal may be due to working outside the peak excitation (549nm) and peak emission (575nm). Getting as close as possible to these parameters is critical for maximal signal. Many fluorescent spectrophotometers read only in the center of the well. It may help to ensure that your plate reader is capable of reading at the bottom of the plate and ensure the instrument is set up as such. We would also recommend to increase the PMT gain (photomultiplier tube) on the instrument. Another option is to increase the concentration of TMRE to 1000nM and increase the density of the cells. With mouse embryonic fibroblasts, we would recommend to test the following densities on a 96 well plate to find optimal seeding = 50,000 / 25,000 / 10,000 / 5,000. Using a titration of cells, we recommend testing different TMRE concentrations (1000nM, 200nM, 50nM). I hope this helps, if not, please let me know and I will be happy to help you further. I have blood smears with red blood cells infected by intracellular parasites that grow in RPMI medium. These slides are already done and they are in storage for a few months. I am looking for mitochondria markers to evaluate apoptosis by fluorescence microscopy with double staining with TUNEL Assay. For TUNEL Assay, the slides are fixed with paraformaldehyde. I thought about TMRE (ab113852). Considering the RPMI medium and the cell fixation with paraformaldehyde, do you think that I can use TMRE? Is there any other suitable kit I can conduct with these samples? TMRE can only be used with live cells—an active membrane potential is required for staining. This will be true of all membrane potential sensitive dyes (including JC-1). I'm wondering about what solutionI can use to dilute TMRE? Would PBS containing 0.2% BSA be fine? I used DMSO and the assay is not working, probably because high amount od DMSO was too toxic for the cells. Culture media is known to cause background using kit ab113852. For suspension cells, we recommend pelleting the cells, removing the culture media, resuspending in the same volume of 0.2% BSA in PBS, pelleting again, and resuspending a second time in 0.2% BSA in PBS before transferring to a microplate.